Whether you are exploring our trails on foot, bicycle or on horseback, we hope you enjoy your stay in the Alleghany Highlands of Virginia. Please practice good outdoor ethics of preserving the environment and respecting private property. Most importantly, stay safe so you can come back again and enjoy more of the Alleghany Highlands’ outdoor treasures. Be prepared before heading out on the trail. Cell phone service may be limited in remote areas of the Alleghany Highlands. Have plenty of food and water. Dehydration can occur in any kind of weather. Carry a first aid kit with materials to treat minor cuts, bug bites and stings, sprained ankles and other common injuries. Always let someone else know your planned itinerary and when you expect to be back. Know the terrain you’ll encounter. This is especially important when hiking, biking or riding with kids. Weather conditions can change quickly in the mountains. Check the latest forecast and be prepared for any possible weather situation. For more information about hiking, biking, riding and camping in the George Washington & Jefferson National Forests, contact the James River Ranger District – 540-962-2214. 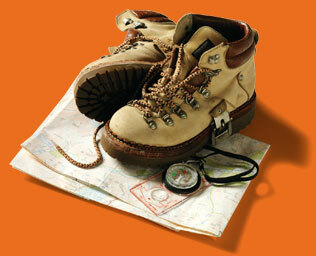 Maps, descriptions and directions can be found in this handy, pocket-sized trail guide.